There are lots of great baby toys out there. 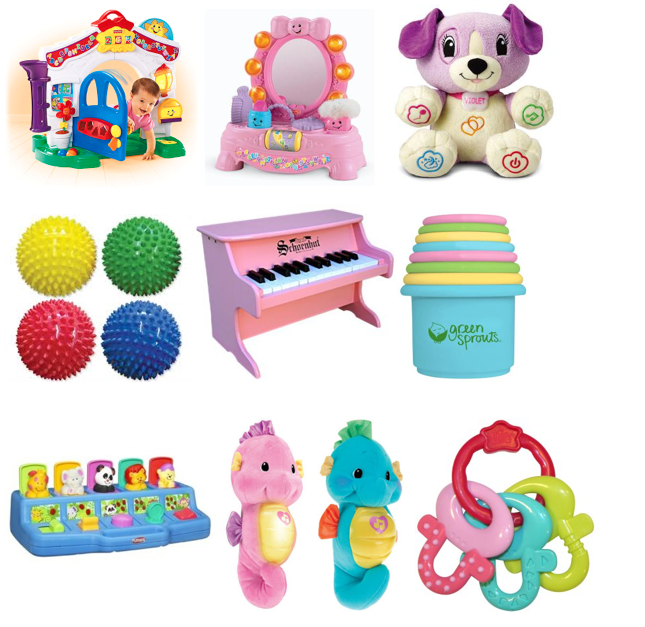 Here are a few that are especially great for 6-12 month olds. If you need toys for your baby, or gift ideas for someone else little bundle, here are some great options to choose from. 1. Fisher Price Learning Home. This is one of the best learning toys out there. Your baby will play with this toy for a couple of years. There are so many things to explore and to master as each baby reaches new milestones. A+, although it can be taxing to put together. 2. Fisher Price Laugh and Learn Musical Mirror. My 9-month-old loves this toy. She likes to look at herself, chew on the bracelet teether, and feel the fluffy “makeup brush.” Plus, it’s super cute. 3. Leapfrog My Pal Violet. This becomes a friend for your little one. You can program her name. The puppy sings songs and lights up. It’s a lot of fun, and it’s cuddly for bedtime, too. 4. Green Sprouts Stacking Cups. Every baby should have a set of stacking cups. They are fun to play with, and as she gets more coordinated, she can actually practice stacking them and putting things inside. 5. Edushape Sensory Balls. Great sensory toy, and also gets baby moving as they roll. The texture is very fun for baby. 6. Schoenhut Toy Piano (or any toy piano, for that matter). Babies love to bang the keys and hear the music, er, the sound. A piano is also great for learning cause and effect. 7. Playskool Busy Poppin Pals. Baby will love the cute animals, and will also learn how to close the tops. She will learn how to press a button, turn a knob, etc. in order for the creatures to pop up. 8. Fisher Price Ocean Wonders Soothe and Glow Seahorse. This cute seahorse gives off a subtle, diffused light perfect for bedtime. Also, it plays soothing music, and automatically shuts off. This has been a bedtime must-have for all three of my girls. 9. Bright Starts Keys Teether. Babies at this age are teething – big time. The bright colors will attract your baby, and the different textures on the keys will give her the lots to choose from in order to soothe her little gums.